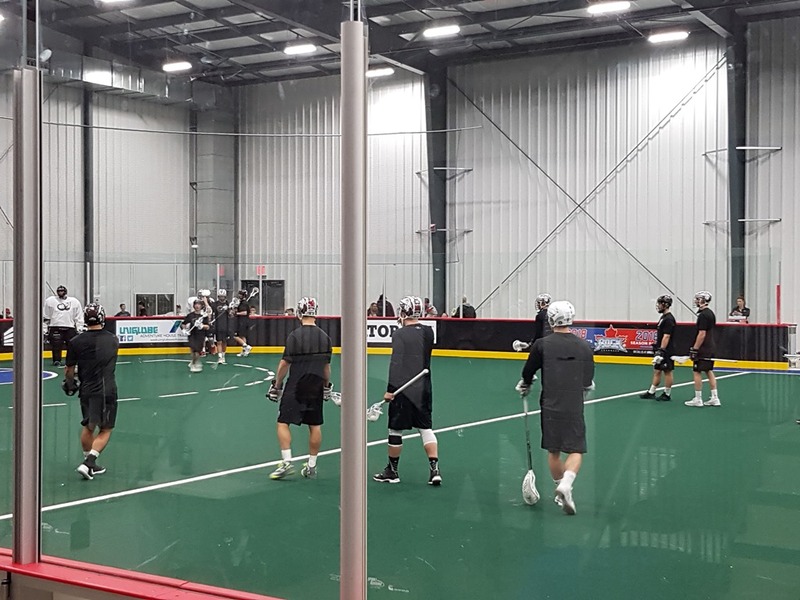 Saturday night featured the final game of the pre-season, the New England Black Wolves visiting the Toronto Rock. After a strong first quarter, the Rock gave up the lead in the second and were down 7-5 at the half. New England continued their strong play in the low-scoring third, taking a 9-6 lead, but Toronto’s offense suddenly came to life in the fourth. They scored four goals in about a minute and a half to take the lead. New England tied it up at 10 but two more goals by the Rock plus an empty-netter gave the Rock a 13-10 victory. Aaron Bold started in net for the Black Wolves, and I was interested to see how he’d perform for his new team. The answer: pretty well. He only allowed five goals, and made all the stops he was expected to make. He wasn’t super-energetic but wasn’t really tested much so he didn’t have to be. Doug Jamieson played the second half and despite giving up more goals, I thought he was better than Bold. He faced an Adam Jones penalty shot, where he waited Jones out and then prevented the last-second dunk attempt, and stopped a Latrell Harris breakaway as well. He did allow the four goals in 90 seconds but besides that short blip, Jamieson was great. Nick Rose played the entire game for the Rock and was solid. One move he seems to be making more this year is when a shot comes in low, he stops it and flips the ball high in the air, then either catches it or reaches up and scoops it. Seems like a dangerous move to me; I’d rather have him just catch it, but it’s better than giving up a rebound. Both teams were without one or two of their top scorers: neither Shawn Evans nor Kevin Crowley played for New England and Tom Schreiber was missing for the Rock. Evans was there and participated in the warmups but didn’t play in the game. I thought Kyle Buchanan and Reilly O’Connor played really well on the offense and David Brock on the D. I was sitting near friends and/or family of Wolves transition player Colton Wilkinson, and he also played well, even scoring a pretty transition goal. For the Rock, I saw Dan Lintner a lot, and Hellyer / Hickey / Jones looked pretty good though there were some sloppy plays here and there – someone passing to where someone else was a few seconds ago, or where they thought they should be rather than where they are. I also noticed Drew Belgrave and Brock Sorensen on the defensive side. Belgrave’s got some speed and made a few nifty moves on some Wolves defenders while waiting for the offense to get onto the floor. If the Rock are going to be without Jesse Gamble this season, Belgrave looks like he might be a pretty decent replacement. Scorers: for New England, Kyle Buchanan (3), O’Connor (2), and singles by Oakes, Chaykowsky, Bomberry, Coyle, and Watkinson. For Toronto: Hellyer (3), Hickey (3), Jones (2), Lintner (2), Reinholdt (2), and Caputo (who still doesn’t have his name on his jersey) had one. The Rock’s game summary featured this description of Reid Reinholdt’s goal in the fourth: “Reinholdt scored on a backhand shovel shot that would have made Rock legend Colin Doyle proud.” I didn’t think about it at the time but they’re right – I can totally see Colin Doyle taking that shot. Props to Black Wolves rookie Nick Chaykowsky, who stood his ground as the 6’4″ Brodie Merrill was coming up the floor in transition. Merrill hit Chaykowsky square in the chest but it was Merrill that bounced back – Chaykowsky didn’t move. Dan Lintner scored a goal in the fourth quarter that looked like what I’ll call a “crease-diving alley oop”, which may or may not be a thing. It was on the net furthest from me so I didn’t have a great view, but someone passed him the ball and he dove across the crease and scored. But the timing was such that it looked like he received the pass while already in the air sideways. This would have to be a set play and the odds of it working are almost zero so I’m sure I just got the timing wrong or something. Nice goal though. The Black Wolves were wearing orange jerseys (without names, grrrrrr) with black numbers on the back (see above). Had to remind myself that they weren’t the Bandits. No diet pop at the TRAC! Not all of us are athletes who need Gatorade ya know! Though the bottle of water I ended up having was healthier than the Coke Zero I wanted, so thanks, I guess. The pre-season scrimmages continue this week. 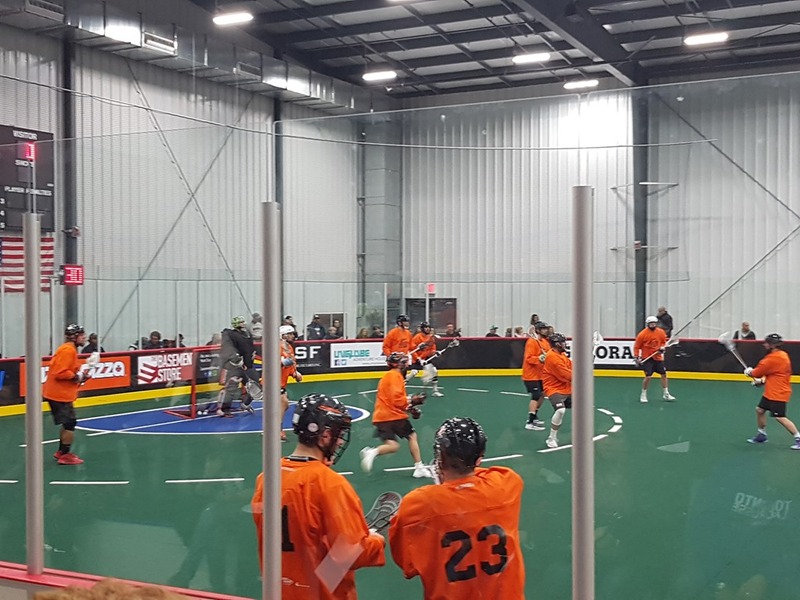 The Rush and Swarm played a rematch of last year’s finals, the Bandits and Black Wolves faced off, and the Stealth and Roughnecks played again after facing each other last weekend. In Oakville, the TRAC was rockin’ once again, this time featuring the Colorado Mammoth taking on the Rock. 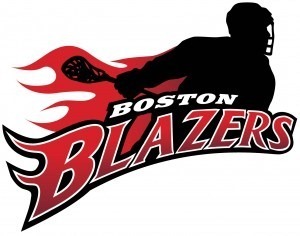 The game ended deadlocked at 15 and they decided not to play overtime, so it ended in a rare lacrosse tie. Most of the Rock players who did not play last week were there this week: Jones, Leblanc, Brodie Merrill, Hostrawser, Chapman, Edwards, and Rose. Still no sign of Challen Rogers or Jeff Gilbert. Nick Rose played the first half in net while Brandon Miller played the second half. They gave up 15 goals so it’s hard to say either one was particularly good but neither was terrible either. Rose and the defense were very good in the first quarter, giving up very few chances. That changed in the second quarter as the Mammoth got back into the game. I didn’t think Brandon Miller was great last week but he was much better this week. The Mammoth outshot the Rock 55 to 50, and that margin got much closer near the end of the game. I think Colorado were outshooting Toronto by as many as 10 or 15 at some points. We finally got a look at Adam Jones in a Rock uniform, and he didn’t disappoint. He did the standard Adam Jones thing, shooting through traffic at a spot he can’t possibly hit, but he hit it anyway. Tom Schreiber seemed a little more frustrated than last week, but Kieran McArdle scored a couple of nice goals. For the Mammoth, I was surprised that I only heard Ryan Benesch’s name twice – once on an assist near the end of the second, and then he scored a goal a minute later. I don’t think he played in the second half. Considering the Mammoth scored 15 goals, I’m a little surprised I didn’t hear the names Jeremy Noble or Eli McLaughlin much either. Dillon Ward started for the Mammoth and didn’t seem to be seeing the ball very well. He was replaced partway through the second quarter but oddly, he went straight to the dressing room and we never saw him again. Steve Fryer took over in net, and the team had no goalie on the bench until well into the third quarter. Brandon Humphrey took over in net in the third. The game started off very physical, but that mostly went away after ten minutes or so. Not entirely, of course, but it wasn’t as chippy as it looked like it was going to be. In the third or early fourth there was one… “incident” is too strong a term, maybe “occurrence”. A couple of players between the benches did the chest bumping thing and some teammates and the refs went over to pull them apart before anything could happen, and that was it. No penalties came from it. Thinking about it now, I think there was a similar “occurrence” near one of the nets later in the game. Again, no penalties. Top players of the game for the Rock: Adam Jones, Brodie Merrill. Dan Lintner only played the first half (I think) but played hard. I’m liking his game more and more. I also noticed Drew Belgrave getting a lot of playing time, and coming up the floor a lot in transition. Brandon Slade scored a very nice transition goal in the fourth – he received an outlet pass around centre and basically ran straight in on goal on a 2-on-1. While the defender protected against the pass, Slade got to the crease, faked the shot, waited until Humphrey made his move, and then shot far top corner. He showed great patience and it paid off. For the Mammoth, I saw Nick Ossello a lot and Jordan Gilles had a strong game in transition as well, setting up a couple of goals on really great plays. I thought Stephen Keogh had a good game as well, but I’m a big fan of his so he’d have to play pretty badly for me not to include him. Goal scorers for the Mammoth: Wardle (3), Keogh (3), Lee (2), and one each for Benesch, Eastwood, Ruest (announced as “Roost”… sigh), Noble, McLaughlin, McKay, and Bal. For the Rock: Jones (4), Leblanc (3), Hickey (2), McArdle (2), and one each for Hellyer, Schreiber, Lintner, and Slade. Both teams had their names on the jerseys except Mark Farthing for the Mammoth and Phil Caputo for the Rock. Caputo’s name wasn’t on his jersey last week either, but all of the rookies’ jerseys had names on them, so I’m not sure why Caputo got hosed. Play was still pretty sloppy but not as bad as last week. Weird play of the night: I’m not sure of the details but it looked something like this: A Rock player deflected the ball towards his own net, and Rose made a casual stick save, launching the ball into the air. When it came back down, another Rock player somehow hit it back towards the net, and again Rose made a stick save, knocking the ball behind him over the net. It hit the boards or took a weird bounce or something and ended up in front of the net again, just rolling slowly towards centre but out of Rose’s reach. No Rock player did anything but a Mammoth player grabbed it and took a quick shot. Rose stopped that one as well. Three saves but only one actual shot. The music was very loud. Like, very loud. In the first half, some fans tried a “Go Rock Go!” cheer but it was completely drowned out by the music and didn’t last long. The team actually had former Rock player Nick Diachenko as the DJ for the night (I believe that’s his non-lacrosse job), and sorry Nick, but I wasn’t impressed. There were a ton of remixes; it seemed that 80% of the songs were either originals or covers (of various genres) sped up with drum machines backing them up. It sounded like we were at a dance club, and I haven’t been to a dance club for 25 years. Then again, a 48-year-old man who doesn’t dance is not likely his target demographic so I imagine he couldn’t care less whether I was impressed or not. The younger woman sitting next to me and the teenage girl a couple of rows ahead of me were dancing in their seats all night. The NLL is back! After a long summer, we finally have NLL action again, even if it’s pre-season. 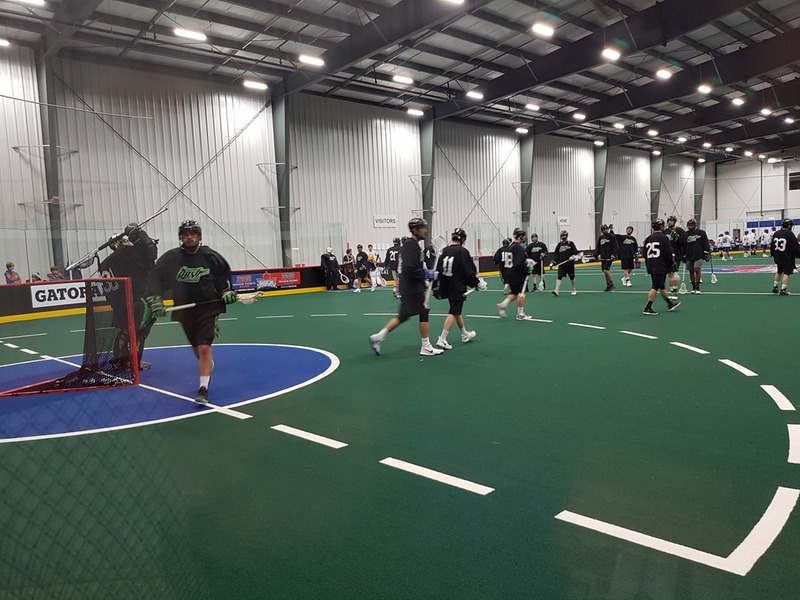 In fact there’s lots of it: not only did the Rush take on the Rock at the TRAC on Saturday, the Roughnecks played a doubleheader at the LEC, playing the Mammoth in the afternoon and the Stealth later in the evening. I’m guessing that was a split-squad thing like they do in baseball. I arrived late to the TRAC, only 10-12 minutes before game time. As a result, I got the honour of standing for the entire game, down in the corner near the scoreboard. I was right at the glass though, so it wasn’t so bad – see the picture below. I had a great view of half the game and a lousy view of the other half. This being a pre-season game, both teams had some missing pieces: the Rush played four goaltenders, one for each quarter, none of whom were Evan Kirk. Chris Corbeil, Nic Bilic, and Jeremy Thompson were also missing, and Mark Matthews, Jeff Shattler, and Ben McIntosh only played the first half. At the other end, Adam Jones did not make his Rock debut, and Challen Rogers, Sandy Chapman, Stephan Leblanc, Brodie Merrill, Jeff Gilbert, Bill Hostrawser, Damon Edwards, and Nick Rose were out. As I said, the Rush played four goaltenders, each looking for that coveted “backing up Evan Kirk and thus working the door for 95% of the season” position. This race started and ended strong, as Tyler Carlson was sharp in the first quarter and former Rock backup Zac Boychuk did well in the fourth though he was at the far end of the floor so I couldn’t really tell. Pete Dubenski played in the second and again, he was at the far end from me but Adam Shute was near me in the third. He wasn’t bad but did allow a couple of soft ones. The Rock also swapped goalies, with Brandon Miller playing in the first half (and struggled a little – not quite the strong performance we saw at the Heritage Cup a few weeks back) and draftee Riley Hutchcraft playing in the second half. Hutchcraft came out wearing #1 in the third quarter, but was wearing #52 (with no name on the jersey) in the fourth. 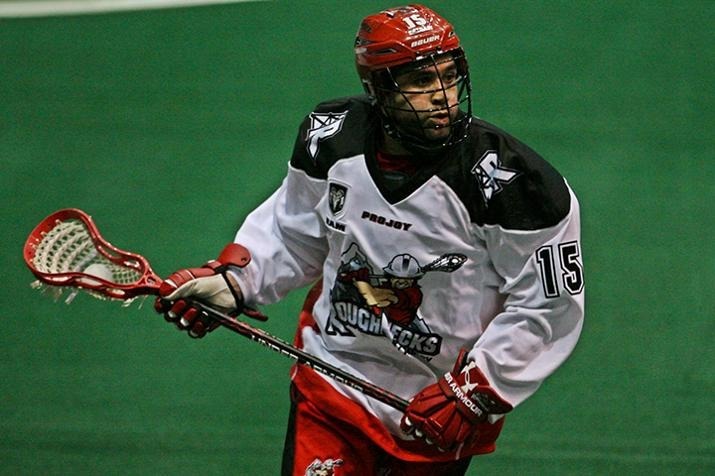 I confirmed with the NLL’s Tyson Geick that it was still Hutchcraft, who must have changed jerseys. Hutch (I’m assuming his nickname is Hutch) allowed a couple of quick goals to start the third, but settled down and played pretty well after that. Mark Matthews. Mark Matthews is awesome. That’s all I have to say about that. Jeff Shattler made his Rush debut and looked good, scoring one goal. The Rush defense looked as strong as ever, despite being down a few regulars. By the time we were halfway through the first quarter, I had noted pass interceptions by both Dilks and Rubisch. In the second quarter, a Rush player took a shot, which Miller stopped. The ball dropped and began rolling towards the goal line, but Miller couldn’t see it. Defender Brandon Slade did and grabbed it before it crossed the line. Nice play. More D: During a Rush 5-on-3, Brad Kri and Latrell Harris both made some great plays to prevent goals. I believe the Rush did eventually score on the 5-on-3. Near the end of the second quarter, the music playing on the PA suddenly stopped and all you could hear was the sound of the game. This was awesome, but they started up the music again a couple of minutes later. At the end of the second quarter, Brock Sorensen found himself in front of the Rush crease with the ball while on the move. He scored a beautiful jumping goal… that went in about a half-second after the buzzer. It didn’t count, but it was a thing of beauty. Tom Schreiber looked to be continuing from where he left off last season. I had to smile when I heard my first “Schreiber, from Hellyer and Hickey” call. I suspect I’ll be hearing those three names, in various orders, many times throughout the season. Lots of dropped and missed passes on both sides. “Mid-season form” this was not. Would have been nice to see Adam Jones. Looking forward to hearing my first “Jones, from Hellyer and Hickey” call. One of Tom Schreiber’s three goals was assisted by Seth Laidlaw but the announcer said that Lyndon Bunio got the assist. It likely makes no difference at all but for the record, it was Laidlaw. Robert Church did play but I barely noticed him. It’s possible he also only played half the game. I will leave home earlier for next week’s game in the hopes of getting a seat. The seats at the TRAC aren’t that comfortable, but it’s better than standing for two hours. Only one person on either team was listed as transition: Rush rookie Austin Murphy. Rock rookies I noticed: Drew Belgrave looked very large, Connor Cole looked very fast, and Brett Ulbikas and Lyndon Bunio look like they need to be added to my name pronunciation guide. If Bunio makes the team, I apologize in advance for the number of times I will accidentally type “Bunion” instead. The Rush didn’t have names on their jerseys so it was a little harder to spot the rookies. Derek Keenan was not behind the bench for the Rush – he was upstairs in the press area. I imagine it’s a bit of a treat to watch your own team from afar without having to be involved in every decision.